Kansas City police diverted traffic away from Crown Center early Friday morning ahead of President Donald Trump's speech at a national law enforcement conference. KANSAS CITY, Mo. 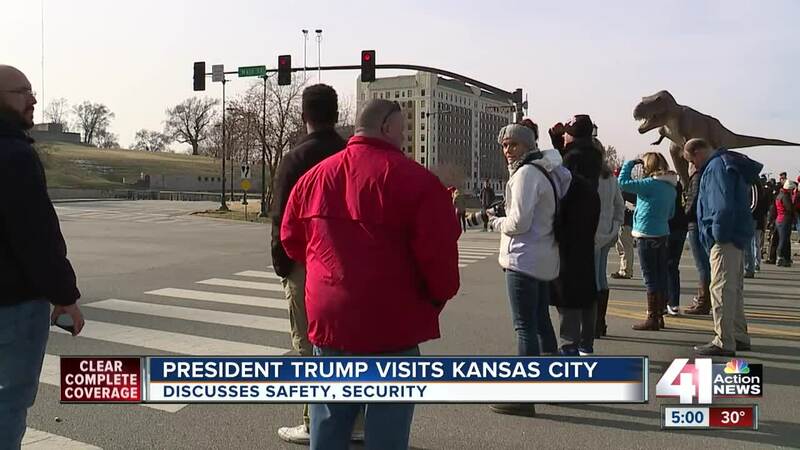 — Kansas City police diverted traffic away from Crown Center early Friday morning ahead of President Donald Trump's speech at a national law enforcement conference. A large police and security presence could be seen at every street corner as Crown Center was locked down for several hours. Dozens of supporters and protesters lined the streets around the Westin Crown Center hotel, many hoping to catch a glimpse of the president, who addressed the Project Safe Neighborhoods National Conference . "Well, we skipped ' Tuba Christmas ' to come and show our support for the president. We think it's important no matter which side of the fence you're on, you need to support the president," Gena Robertson said. Holding signs that said "Go Trump" and "Thank you Mr. President," supporters outside the Crown Center had a message for everyone. "He's doing a great job and he gets a lot of negativity from the news and he just...he deserves it, he deserves to have his accomplishments known," Kathy Romey said. Protesters also made their voices heard, many in a last-minute effort after only learning about the president's visit late Thursday. "We're out here to say that police brutality is not okay in our community, it's not okay in any community and that black lives matter and our president now does not support these ideas and we're here to tell him that he needs to," Michelle Lawson said. Though people lined the streets to await the presidential motorcade, many did not stick around long after Trump arrived. Both protesters and supporters said they hoped their efforts outside the Westin Crown Center made a difference. Roads surrounding the hotel reopened after Trump boarded Air Force One to go back to Washington, D.C.